2011 Outback, Is there a way to open the rear hatch from the inside? Page 9-19 in the manual. Remove the small access panel on the back of the liftgate. You can't buy happiness but you can buy horsepower and that's kind of the same thing. Yep like he said. Small about one inch square just inside the latch. There is a small piece of white plastic in there that you move upward to manually open the latch. 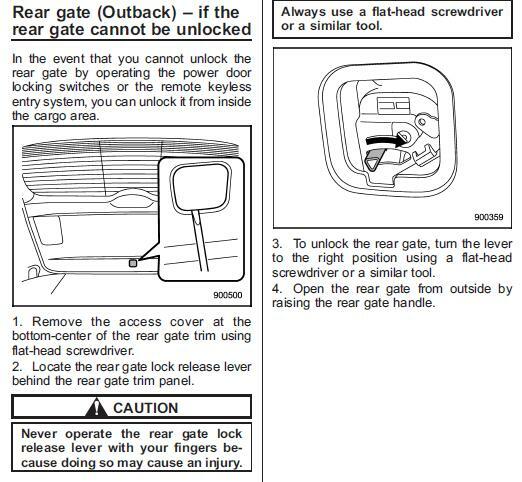 Just to be clear, the page 9-19 procedure is used to unlock the rear gate, for example, if the battery is dead and/or the power door lock doesn't work, but it doesn't release the door latch and open the door. That still requires using the external handle. Take off cover. Move little white lever. Push on gate. It will open. I have done it many times. Only way to open it if you are working on gate and have the gate finisher off. I have an extra switch off of a scrap finisher but sometimes forget to put it in until after I have closed the gate. The button opens the gate electrically. The white lever is directly opening the latch manually. My 07 Owners Manual has an almost identical instruction, and it definitely does not release the catch -- all it does is unlock the mechanism so that the external handle will work. Thanks for the help, I'll give that a try. Has anyone looked at installing a switch inside the back area to open the hatch? Well, it appears that if you read the Owners Manual, you wouldn't be any better informed. It doesn't say the hatch can be opened from the inside (which is the original question), only that it can be unlocked from the inside. Sedans have a trunk release handle in the event someone is trapped inside with no access to the car interior and side doors. It allows for exit without having anyone outside to open the trunk. With a wagon, this isn't normally necessary because the side doors are accessible and can be opened without using the power lock/unlock system. This is why I understand that my 07 has a manual rear hatch unlock lever (behind a pull-off panel) but still cannot be opened from inside. I'm fascinated to learn that the 2011 system actually enables someone to both manually unlock and open the hatch from inside. So I guess I've learned something new as well.